Time for more spiralized veggies (and fruit)! This time, they're done up in ways you've never tried before... Make them ASAP! Stop what you're doing, because this recipe deserves your full attention. 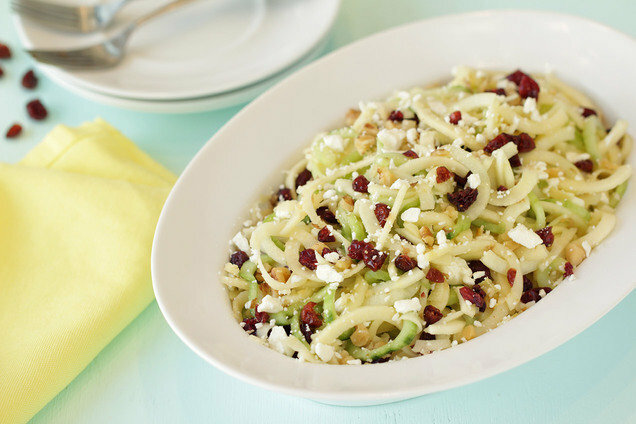 Spiralized apple and cucumber are amazing together... especially in this salad! Peel Fuji/Gala apples, cucumber, and Granny Smith apple. Using a tabletop spiral vegetable slicer (like the Veggetti Pro), cut apples and cucumber into spaghetti-like noodles. (If you don't have a tabletop spiral veggie slicer, cut them into matchstick-sized strips.) Roughly chop for shorter noodles. Finely chop any remaining apple. Place in a large bowl. Add remaining salad ingredients, and toss to mix. In a small bowl, combine all dressing ingredients. Whisk until uniform. Add dressing to salad, and toss to coat. Remove skillet from heat, re-spray, and return to medium-high heat. Add beef, and sprinkle with 1/2 tsp. Italian seasoning, 1/2 tsp. garlic powder, 1/2 tsp. onion powder, and 1/8 tsp. each salt and pepper. Cook and crumble for about 5 minutes, until fully cooked. Transfer beef to a large bowl. Add drained zucchini, tomatoes, and remaining 1 tsp. Italian seasoning, 3/4 tsp. garlic powder, 3/4 tsp. onion powder, and 1/8 tsp. each salt and pepper. Mix well. Transfer mixture to the baking pan, and smooth out the top. In a medium bowl, combine ricotta cheese, egg whites/substitute, chopped garlic, and nutmeg. Mix until smooth and uniform. Spread ricotta mixture over the contents of the pan. 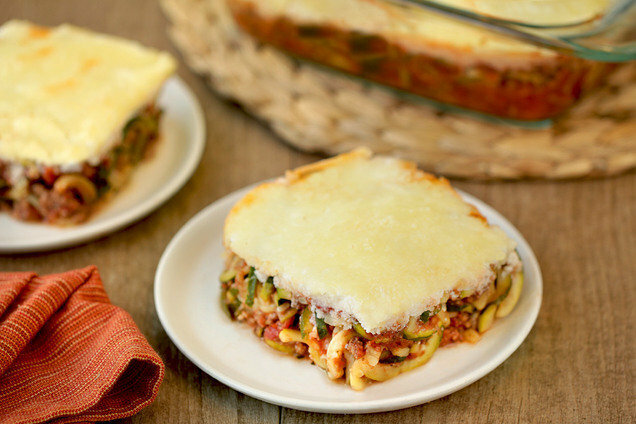 Top with mozzarella and Parm. Bake until hot and bubbly, 20 - 25 minutes. It's National Peach Cobbler Day, April 13th. How good does a Peach Cobbler Smoothie sound? Exactly! Help your buddies eat their veggies in creative ways! Click "Send to a Friend" ASAP.